In 2008, I was living in Spain. What was election night like far from home? Patriotic, for starters. And long, very long. Being six time zones east of Washington, DC, made November 4 last almost until dawn. This is an article I wrote about that night for Guidepost, the official magazine of The American Club of Madrid. 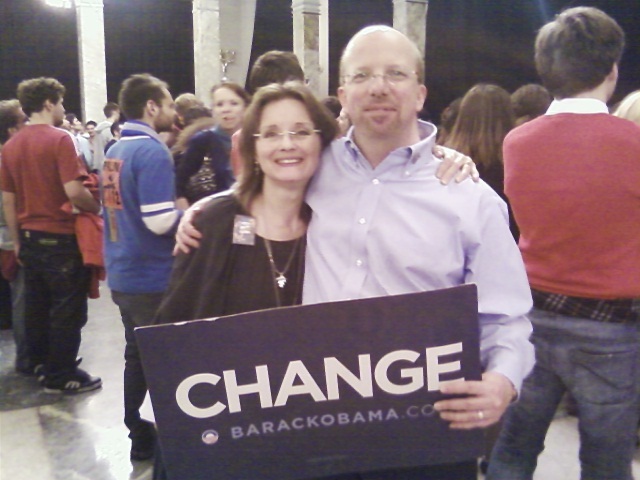 Tomorrow’s election, ten years later and here in Chicago, will be very different. “In the unlikely story that is America, there has never been anything false about hope,” Senator Barack Obama said in a much-quoted speech given in New Hampshire during the primaries. “Yes we can.” Full of hope, we crowded into the Círculo de Bellas Artes in Madrid for the election night party on November 4. Like everything else about the campaign, enthusiasm exceeded expectations. The party’s organizer, Democrats Abroad Spain, had hoped for 2,000 people at the event, which started at 11 p.m. But Obamamania had taken hold in Madrid, and far more wanted to attend. Lines several blocks long formed outside the entrance. Inside, results trickled in. At 1 a.m., Obama got his first victory: Vermont, with three electoral votes. Everyone cheered wildly. But Kentucky, with 8 votes, had gone for McCain. A few voices booed. Then we kept waiting. People had come ready for a patriotic party. Many were dressed in red, white and blue, sported Obama t-shirts and buttons, had the campaign logo painted on their face, or carried placards or American flags. Several men wore American flag ties. One woman sparkled in a star-spangled sequined vest. Live music and televised results on big screens filled the ground floor of the building. The band Guns ‘N’ Butter had people dancing when the Salón de Columnas on the fourth floor opened up at 1 a.m. It was showing CNN’s election night special report on three large screens. That’s where my husband and I wound up, sharing maps and tidbits of geopolitical wisdom with old and new friends as we watched the results with undivided attention. The room was soon packed to overflowing. At 1:30 a.m., we screamed as Obama took the lead in Florida, a sign of a possible national victory. By 2 a.m., some people were already exhausted and lay on the floor around the TV screens as the lead grew to 77-34 electoral votes. At 2:15 a.m., CNN called Ohio for Obama — great news. By 3:10 a.m., the crowd began thinning out, since the outcome was becoming clear. At 3:20 a.m., my friends and I studied a map and did the math, then considered buying a bottle of cava, Spain’s answer to champaign. But we didn’t dare celebrate, not until the final results were in. Probability wasn’t good enough. We had to be sure. We kept waiting. As 5 a.m. neared, everyone got on their feet. The polls closed on the West Coast, and, immediately, CNN projected victory for Obama! We screamed. We hugged. Ten minutes later, we were still screaming. Yes we can. Si se puede. O-ba-ma! And though was already 6 a.m., no one would leave until President-Elect Obama spoke. Finally, he took the podium in Grant Park, Chicago. A woman near me, who had painted little American flags on her fingernails, wept. My eyes were wet, too. And so we all finally left into cold pre-dawn darkness. An unlikely candidate, an unlikely story, and hope. We can change America and the world. Yes we can.